Last week during holidays we visited the German city of Halle where the Nebra skydisc is presented in the “Landesmuseum für Vorgeschichte” (“national prehistoric museum”) along with the other items that were found with it and much more prehistoric artifacts. We also visited the Arche Nebra visitors centre in Nebra, where the disc was found, but that was not too interesting. Nearby there is a ‘sun observatory’ (like Stonehenge) in Goseck, the two are in some ways connected. The Nebra disc is 3600 years old. It depicts what appear to be a sun and a moon and stars. Later the strips on both sides were added (and the left one again lost) and the bow at the botton of the disc. There is a lot to say about the disc, things that you can probably find elsewhere on the world wide web. The crescent would be a ‘third phase’ crescent and when this phase appears together with the Pleiades in the morning sky at the summer solstice, this means that the current year is a leap year (every third year is one) and a month has to be added in order to have the moon-months and sun-years correct again. 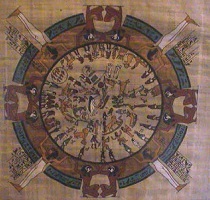 The arcs on both sides refer to the solstices and the arc on the bottom could be a bark floating between both solstices. This is not what I wanted to write about though. There was a film in the museum saying that there are several similar tables, Eastern, Egyptian, Babylonian and South-American, often calendars. The Nebra disc is about 3600 years old. The first stones of Stonehenge would be erected 4400 years ago and the Goseck circle is 2000 years older than Stonehenge. 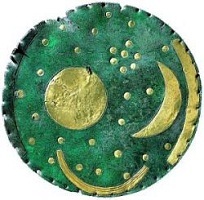 Apparently the Nebra disc is the only of such artifacts which does not depict any Gods or mythological representations, but when I was looking back to see what kind of people lived in Northern Europe around 1600 BCE, I ran into another sundisc which is about the same age as the one of Nebra. 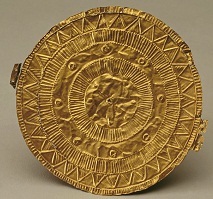 The Moordorf disc (second above) is completely made of gold, found in Eastern Frisia (in nowadays Germany) and does not appear to have any Gods either. 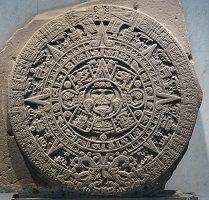 I have not been able to find much information about it, but some people seem to think that this sundisc is a calendar based on the course of Venus. The times of creation of the other artifacts above of course differ greatly, from 7000 years ago to relatively recently, but I wanted to show some comparable items, the Northern European two are the Godless ones. The Nebra and Moordorf discs of course predate Celtic and Germanic habitation of the area and both are from the Bronze age. The question is if especially the Nebra disc was essentially functional, that the people who made it did not have any notice of Gods or that they purposely created artifacts without displaying them. Could Gods only have come to these parts with the coming of the (pre-)Celtic peoples or did the Nebra people simply not know (or want to) display them? The idea is tentalizing. I may have little statues of Freya, Odin and Thor, but I prefer more abstract symbols such as the Irminsul. The Gods are not persons or characters to me, but just a way of displaying some sort of idea/principle. Would a Godless heathenry point to an advanced or rather a backward kind of heathenry? The fact that already 2000 years earlier a sun-observatory was built that predates anything similar in the world could point towards the first (advanced). 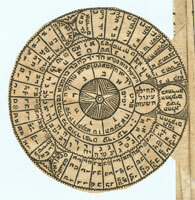 The disc is supposedly used in some ritualistic context. Rock carvings of sundiscs on sticks have been found in Scandinavia, so the disc does seem to have been a religious object, a religion without Gods? What do you make of it? It is the Milkyway,the “greatest God”. The agrupation of points is the Pleyades constellation. 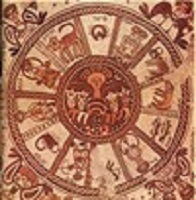 All ancient cultures had access to the same T.V channel of “the stars”. The concept of religion is more modern than we think, they had magic… “native science”. The gods and goddess had their roles within nature and society, not at higher beings but as “guardians” or “keepers”. They arent nature or fate, they take part of it… being as vunerable to the changes of “destiny” (Wyrd) as we are. I don’t think of gods as “persons” as such either, though I might experience them as though they are – to me they’re aspects of the ineffable, as in Hindu philosophy, which makes most sense to me. I agree with Wardjo that they are subject to, and rise and fall (ie come to the fore and then lie dormant) in accordance with, Wyrd. As the OE poem says “Of all the powers, Wyrd is strongest”. I see Wyrd as the ultimate power, the energetic pattern behind everything.